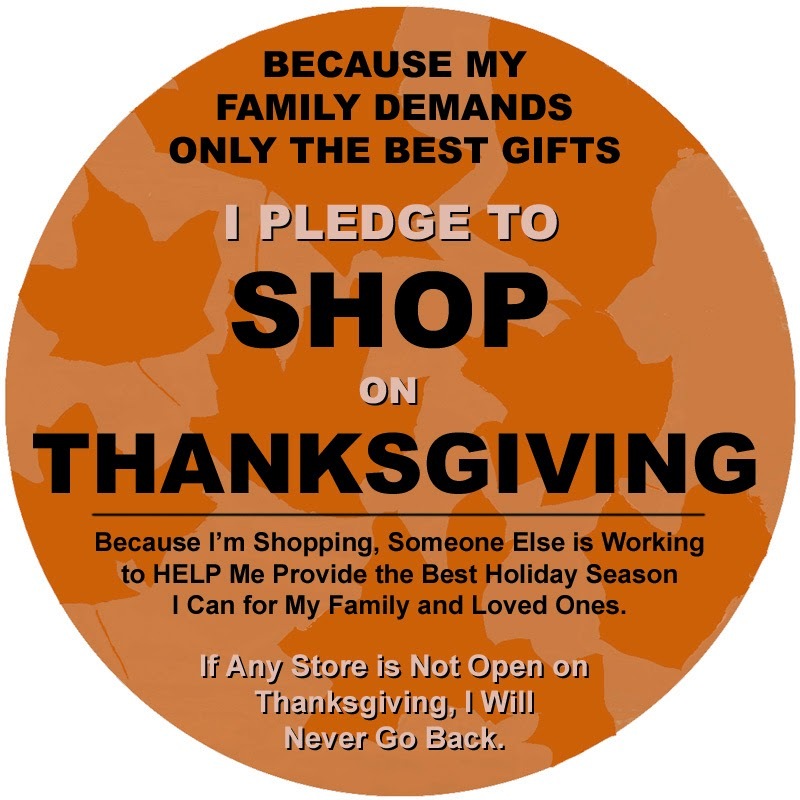 Grandma Slump: Take the Thanksgiving Pledge: I Shall Shop! I'm up in arms this year, as I understand there are various ones agitating for businesses to be closed on Thanksgiving. Of course this is just more of the same, the undercutting that we've unfortunately come to expect of our valued American traditions. Apparently their philosophy goes something along these lines, Anything old and established needs to give way to something new, something modern. And so it is, they want something different simply for the sake of being different. Like I said, I'm up in arms about it and I'm not going to take it lying down. I'm fighting back. 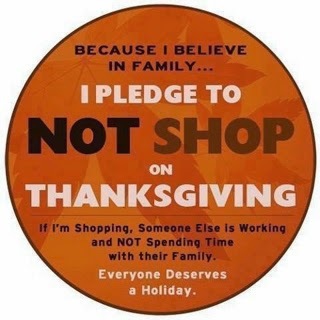 By making a pledge, along with a warning to businesses, that I will be shopping on Thanksgiving, as always. With the warning that if any store is not open on Thanksgiving, I will never return there. And that's a biggie, because I'm totally hooked on shopping, and it might be tough for me to keep that particular codicil. Still, surely there will be thousands joining me whose discipline in that regard might be stronger. Plus, just issuing the warning, stated as strongly as it is, will give businesses pause about daring to close on Thanksgiving. I don't know exactly where all this trouble started, but if I had the resources it'd be interesting to trace it and find out precisely who is to blame. It could be the employees of the big stores and shopping centers who are merely lazy and looking for a way to take the day off. Laziness is epidemic, as we all know. I know some kids, for example, who don't have a single muscle on their skinny little bodies. All they do is vegetate on couches, sometimes mustering up the strength to play video games for a few minutes before collapsing. You figure they have parents, and that some of those parents work at these stores. They're jealous of their kid's lethargy and dissipation, so they want a day off. What I actually think, those I believe are probably responsible, are all the bleeding hearts on Facebook. You see their posts all the time. They're sentimental about every puppy, every kitten, every dying horse, every selfie their idiot kid comes up with, every Bible verse, every "witty" saying, along with cartoons of little old ladies saying ironic things that undercut their dignity, etc. Of course they've gone soft. Then there's grandchildren, and we all do love our families. But instead of taking the day off, that's a huge reason why I'm calling us back to our senses. Don't do away with Thanksgiving shopping! Your kids are depending on you! I hope everyone has Happy Holidays this year, and that you get your holiday shopping done, as it should be done, right away, bright and early Thanksgiving Day. Let me wish you all the best for a splendid and blessed Thanksgiving, as you accomplish your shopping, then gather to do ... whatever ... fatten up the little skeletons on your couch playing games ... introduce them to a turkey leg, and bring them back from vegetarianism and let them eat like healthy people. Meat, potatoes, and meat.